In this paper the relationship between musical instruments and the rooms they are performed in was investigated. A musical instrument is typically characterized as a system that consists of a tone generator combined with a resonator. A saxophone for example has a reed as a tone generator and a comical shaped resonator that can be effectively changed in length with keys to produce different musical notes. Often neglected is the fact that there is a second resonator for all wind instruments coupled to the tone generator – the vocal cavity. We use our vocal cavity everyday when we speak to form characteristic formants, local enhancements in frequency to shape vowels. This is achieved by varying the diameter of the vocal tract at specific local positions along its axis. In contrast to the resonator of a wind instrument, the vocal tract is fixed its length by the dimensions between the vocal chords and the lips. Consequently, the vocal tract cannot be used to change the fundamental frequency over a larger melodic range. For out voice, the change in frequency is controlled via the tension of the vocal chords. The musical instrument’s instrument resonator however is not an adequate device to control the timbre (harmonic spectrum) of an instrument because it can only be varied in length but not in width. Therefore, the players adjustment of the vocal tract is necessary to control the timbre if the instrument. While some instruments posses additional mechanisms to control timbre, e.g., via the embouchure to control the tone generator directly using the lip muscles, for others like the recorder changes in the wind supply provided by the lungs and the changes of the vocal tract. The role of the vocal tract has not been addressed systematically in literature and learning guides for two obvious reasons. Firstly, there is no known systematic approach of how to quantify internal body movements to shape the vocal tract. Each performer has to figure out the best vocal tract configurations in an intuitive manner. For the resonator system, the changes are described through the musical notes, and in cases where multiple ways exist to produce the same note, additional signs exist to demonstrate how to finger this note (e.g., by providing a specific key combination). Secondly, in western classic music culture the vocal tract adjustments predominantly have a correctional function to balance out the harmonic spectrum to make the instrument sound as even as possible across the register. In non-western cultures, the role of the oral cavity can be much more important to convey musical meaning. The didgeridoo, for example, has a fixed resonator with no keyholes and consequently it can only produce a single pitched drone. The musical parameter space is then defined by modulating the overtone spectrum above the tone by changing the vocal tract dimensions and creating vocal sounds on top of the buzzing lips on the didgeridoo edge. Mouthpieces of Western brass instruments have a cup behind the rim with a very narrow opening to the resonator, the throat. The didgeridoo does not have a cup, and the rim is the edge of the resonator with a ring of bee wax. While the narrow throat of western mouthpiece mutes additional sounds produced with the voice, didgeridoos are very open from end to end and carry the voice much better. The room, a musical instrument is performed in acts as a third resonator, which also affect the timbre of the instrument. In our case, the room was simulated using a computer model with early reflections and late reverberation. 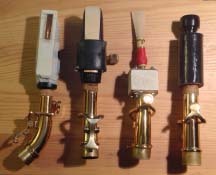 Tone generators for soprano saxophone from left to right: Chinese Bawu, soprano saxophone, Bassoon reed, cornetto. In general, it is difficult to assess the effect of a mouthpiece and resonator individually, because both vary across instruments. The trumpet for example has a narrow cylindrical bore with a brass mouthpiece, the saxophone has a wide conical bore with reed-based mouthpiece. To mitigate this effect, several tone generators were adapted for a soprano saxophone, including a brass mouthpiece from a cornetto, a bassoon mouthpiece and a didgeridoo adapter made from a 140 cm folded PCV pipe that can be attached to the saxophone as well. It turns out that the exchange of tone generators change the timbre of the saxophone significantly. The cornetto mouthpiece gives the instrument a much mellower tone. Similar to the baroque cornetto, the instruments sounds better in a bright room with lot of high frequencies, while the saxophone is at home at a 19th-century concert hall with a steeper roll off at high frequencies.